Allergy Advice: Contains Wheat Gluten, Sesame, Soya, Egg. Storage Condition: Cool and dry place. Ingredients: Wheat Flour, Sugar, Sesame, Palm Oil, Soy Bean Curd, Egg, Shortening, Water, Salt. 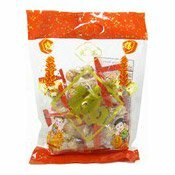 Simply enter your details below and we will send you an e-mail when “Crispy Chinese New Year Cookie Smiling Date (笑口棗)” is back in stock!